8…Lenthal Dam Road-Upgrade & responsibility. 9…Burrum Town future-Will council sell or keep? 11…Torbanlea rail carriage and museum future? NEXT MEETING TO BE HELD ON MONDAY, 1st DECEMBER, 2008. Meeting closed at 9.06 pm. 6..Written approval for re-alignment of boundaries at the HTSC project slow in coming. NEXT MEETING TO BE HELD ON MONDAY, 2nd FEBRUARY, 2009. Meeting closed at 8.40 pm. 7…Where are our rates monies from Burrum District being spent? 13..Coal mining to go ahead in the area near Howard. Expect 50-100 jobs..!! NEXT MEETING TO BE HELD ON MONDAY, 2nd MARCH, 2009. 1…Fire and Flood Appeal function to be held at the Community Centre 19th April 2009. Please attend..
4…Steam train stopping at Howard @ 1:30pm Howard. Hopefully a regular event. 5…A $200 donation to a community member for a needy cause selected by the chamber to be paid. 7…Lentalls dam overflow issues flyer received and discussed. Are we in danger of flooding or not??? 8…Increase your business-Workshops by State Gov. Bob Hockey in Maryborough. Ring him. 9…Workshops for small communities. Councils to take heed says Mal Chard from the Chamber. 10..Planter boxes, new Howard town entry sign and walk of achievement projects under way. 11..Bursary supplied by our chamber to the local schools raised again for reinstatement. 14..Railway land project and proposals – No further advancement made to date. We are soliciting current members to view the web presence and to submit the details of themselves and their business to be included in the member’s area for access by members and the community. They are also invited to participate in making comments on issues in progress or under discussion by the chamber of any other matters of concern to them as business people in the area. Record of minutes will be archived on the site as will information about local events and businesses. Included also details on the executive members of the chamber and flyers and notices of events and articles of interest to our members. NEW MEMBERS INVITED TO JOIN. (NOTE CHANGE OF NIGHT – MONDAY 4TH IS A PUBLIC HOLIDAY). 1…Effort from the BBS, P A,BCC and Community Centre to donate money $200 to a nominated needy person for sewer installation after partner died. 3…. Fund raiser – Community Centre will be holding a fire victims fund raiser on Sunday, 19th April – dinner show from 5.30pm – cost $25.00 – $30.00 – requests that as many members as possible attend. Contact secretary with your bookings. 6…Best use of council reserve land in the area. Airport and General industry usage. 7…The “Steam Train” would be going through on 15th April – unsure if it is stopping in Howard. Contact vice president for details. 10…We need larger development sites here for accommodation projects. No motels etc here for stopovers. Need more land approved by council for this use. 11… Infrastructure – Sewerage, expansion of Community Centre, railway land howard, playground, picnic facilities, playgrounds howard burrum,swimming areas,rural enterprise,Railway Land and Town Area Improvement (footpath’s etc). 12… Recreation – enlarge/improve Skate Park and playground/bridge, riverside – develop picnic facilities and swimming areas. 13…Rural Enterprise programme is keen to get local businesses exposed in the media. Contact us via the president/vice/secretary. BURRUM RIVER FLOODS FROM LENTHALLS DAM? A CASE STUDY IN GATE RELIABILITY AND HUMAN FACTORS, FAILURE TO IMPLEMENT RISK MANAGEMENT PROCEDURE. 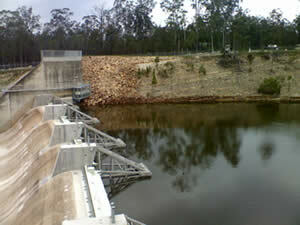 The Lenthalls Dam Crest gates were installed in 2007 and failed to operate as designed from January 2008. In February 2008 high rainfall led to a moderate flood event, all gates inoperable. The gates failed to lower to release flood water. Australia has a strong reputation with respect Dam Safety and Incident management, this near fatal incident offers an opportunity to review and amend existing Dam Safety Requirements, Risk Management and Gate Reliability Criteria. Click here to read the report and click here to view the Wide Bay Water Corporation Blank Emergency Action Plan prepared by Gutteridge Haskins & Davies (GHD). Wide Bay Water Corporation Water Services Provider DRAFT Version of the Operation Manual for Lenthals Dam (prepared by Gutteridge Haskins & Davies) GHD and the Chief Executives Officers Responsibilty (Tim Waldron CEO). Click here to read an extract of the Click here to read Wide Bay Burnett Conservation Council’s letter to the Minister Queensland State Government Department of Natural Resources and Water regarding Wide Bay Water Corporation (Local Government Owned Corporation) of former Hervey Bay City Council now Fraser Coast Regional Council and Interium Resource Operatiors Licence in 2004 and the innundation of Wongi Waterholes due to Lenthals Dam Gates failure to operate. Our chamber of commerce [as others] has a mandate and a policy to promote and assist local existing businesses generally to be profitable and encourage new business to enter and prosper in the Burrum district. The local Fraser Coast Council are updated regularly on developments in the area and are made aware regularly of requirements to facilitate business advancement in the district we represent. The local progress association has a similar but more basic function in promoting advancement in the area. We have an arrangement where there should be little conflict if regular dialogue in maintained. This also covers areas such as Pacific Haven, Stafford Estate and surrounds. There are many modern efficient methods of having available and getting information to our members and the community generally. A list of members businesses will be listed here for the record as well as the profiles of excecutive members. Quick distribution of notices and minutes of meetings are important. All available records of minutes in a published version will be posted here. All members are requested to forward via email, details on their businesses in the form of text and photos. We will assess these for inclusion in this site. These can include photos of business people themselves also to help personalize thier businesses to the viewing public. Please include all contact details, especially email addresses. The community at large as well as members are invited to place comments in this site on any issues raised to which one feels a response is warranted. Posted by Henry Sapiecha 8th April 2009. Publicity Officer for the Chamber. Under Register enter your Name and E-mail Address to receive the chamber newsletter via email.